Russell Wright Seven-Piece Service for Eighteen. 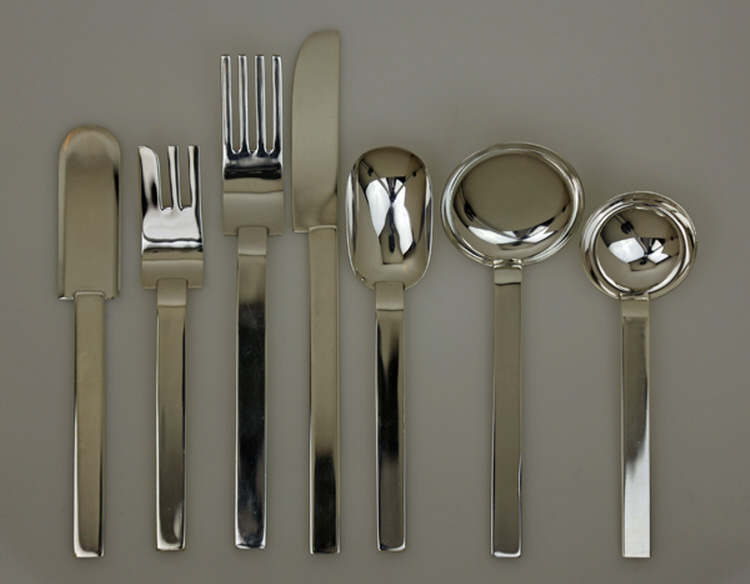 This silverplate flatware service is in a stunning limited reissue of a 1933 prototype flatware by Russell Wright. This limited service was produced for the Metropolitan Museum of Art in 1987. The service consists of a dinner fork (7.625 inches), dinner knife (8.25 inches), salad fork (6.25 inches), teaspoon (6.25 inches), large soup spoon (6.375 inches), small soup spoon (5.625 inches) and butter spreader (6.625). There are 126 total pieces in this service. Each piece bears impressed marks for MMA, 1987, Korea or MMA, 1990, Japan. This service is in excellent condition.